Every year when the garden & orchard harvest come in I say to myself, “I’m going to get a pressure cooker this year”. For one reason or another that doesn’t happen, and my attempts at canning, even with the hot water bath method, fall short. Needless to say, I was ecstatic when the Fagor Duo 9-Piece Pressure Canning Set came in to review. Since I have no experience with other pressure cookers/canning sets, I cannot compare this to anything else, but for my needs it does absolutely everything I need to safety can both high and low acids foods to enjoy for months to come. The process is simple (a little time consuming, but simple) and instructions, including an instructional DVD, as well as some recipes to get you started, are included, so there’s no excuse not to find something to can and go for it. 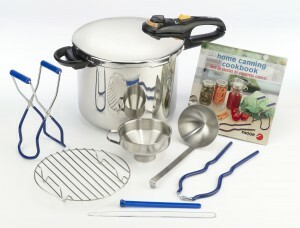 The pressure cooker Pressure Canning Set can be used to cook foods as well, quickly, which makes it a great year-round investment too. Overall, I am happy with what I’ve seen so far, and am excited to use this in non-canning applications as well.